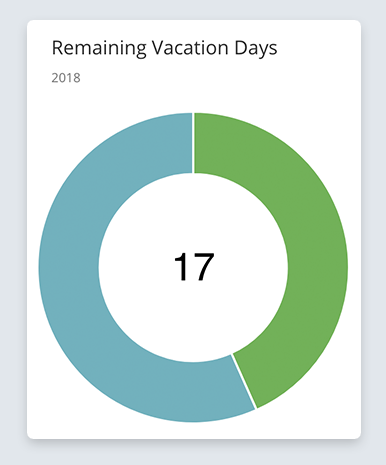 The Vacation and Annual Leave Management extension allows team members to easily track and visualize how many vacation days they have remaining for the year and request vacation or time-off for any date range. Graphical Charts and tables illustrate to the team how much time they have remaining and a request / approval process is in place where team members can request time off and approvers can approve all these vacation requests. 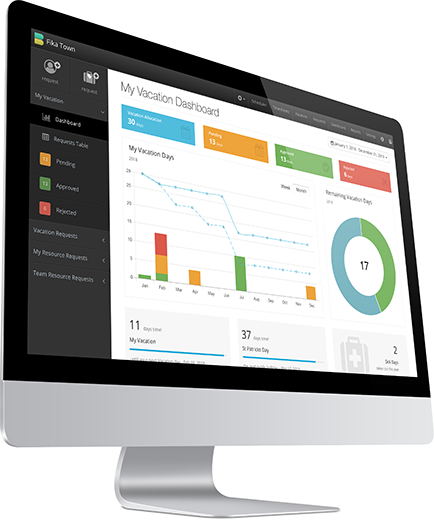 The ability for your team to request vacation / annual leave from Hub Planner allows team members to play a bigger part in the resource management circle for your business. All requests become transparent in the scheduler so you can visualize conflicts and they can be filtered through email or a new vacation management dashboard. Once the vacation or annual leave is approved it is added to the schedule as an approved booking and the team member is notified via email. Every team member can login to their own dashboard and track their vacation / annual leave days for the year giving them greater transparency into their allocation. The Resource Request & Approval Workflow is a great addition to approving requests. 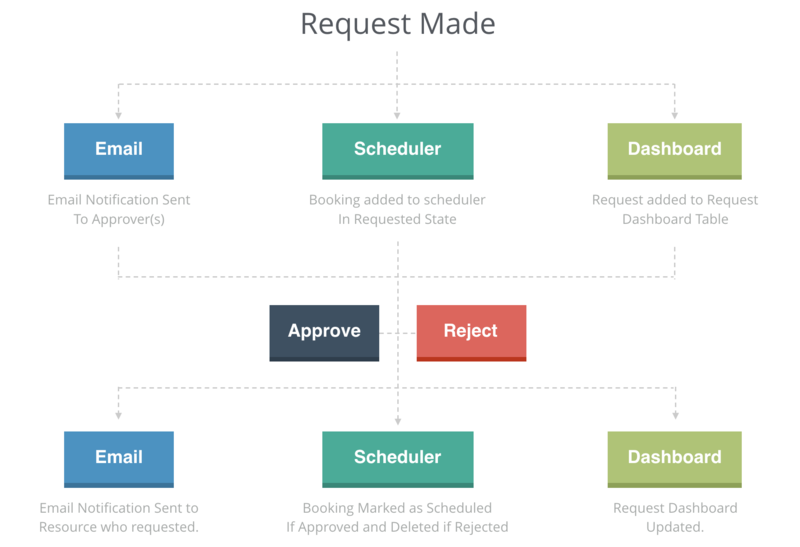 The addition of a request approval flow is a significant part of the flow of Hub Planner’s vacation request software. Default approvers can be set for groups of resources, which creates an immediate hierarchy in the flow. The approver is presented with multiple ways in which they can act on a request. The following chart represents a typical vacation flow when using the vacation request feature in Hub Planner. Depending on your configuration email notifications can be triggered within the flow. There are multiple ways in which you can approve or reject a request from within the system. This extension comes with email notifications and three different options to configure them to globally and additionally on a resource level. Each user can configure the types of emails the wish to receive from their My Notifications setting, while global options can be set from notifications. Approvers will be notified of a new request via email and they will also be able to approve or reject the request directly from the email. When setting up the extension you will see a new section for Vacation and Sick Days. From here you will be able to define on a global level for your company how many vacation days you generally issue. You can further configure this for each resource if resources have custom vacation agreement. Once this is set, then each of the resources will see their correct vacation allocation limit in their dashboard. 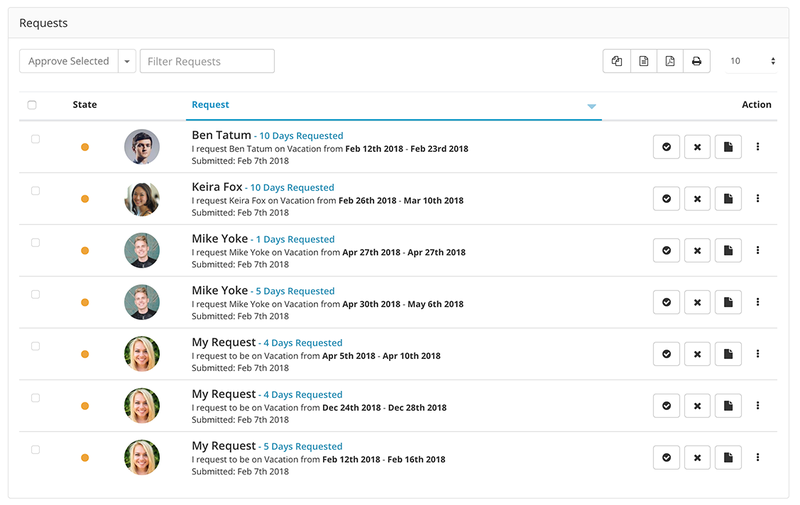 The request table allows you to manage all of your teams requests including your own. You can quickly approve, reject or delete a request as well as adding notes when approving or rejecting requests. You can create exports from the table as well as use smart filters to go through the table quickly. Global allowance and custom allowance of days per resource. Many industries have various calendar years starting at different months. Be it for financial, tax, fiscal or seasonal reasons. We have allowed for you to customize your calendar to begin at your desired month of the year aligning to your business schedule. You can configure so via the settings page and choose your default month from the drop down menu. The vacation request dashboard also has a sick day module which the account owner can define in their settings as to what event defines a sick day. Once this is set, all sick days are also presented to the user so they can have a understanding of how many sick days they have taken within the year. Each team member will be able to see upcoming public holidays directly from their dashboard. Public holidays are controlled from the main settings page. You can configure the extension around roles and rights. The rights management allows you to define if someone can request vacations, and approve vacation requests. You can also configure default approvers for specific team members creating a team centric approval flow. HR managers work with a request flow, allowing you to centralize your teams vacation requests and understand what impact they have in relation to the bigger picture. For team members you have the opportunity to get more involved, have an intuitive and easy to use way of requesting vacation and time off from work. To install the Vacation and Annual Leave Management Extension, login to your account, navigate to settings and choose the manage extensions page. Find the extension from the list and follow the installation steps to try or buy the extension. If you do not have rights you should have the option to request this extension to be installed by an Admin with rights. Once installed you can globally configure your options from the settings page under Vacation & Sick Days. Each individual resource can be adjusted by editing them to have specific vacation days.